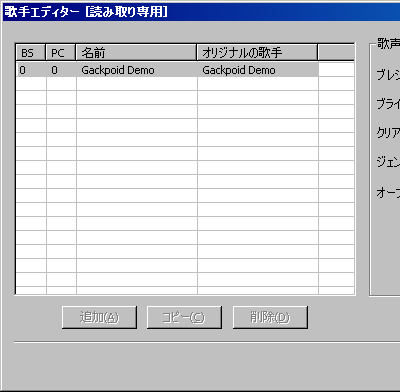 The trial version of Gackpoid can now be downloaded in the official site, and the limitations are only usable for 14 days and you can’t save VSQ files with it. 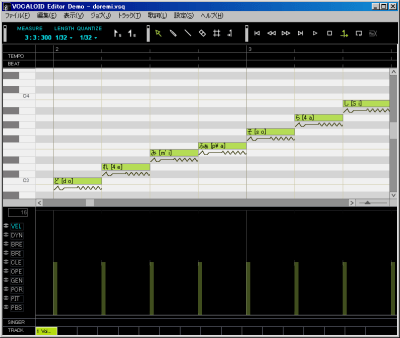 Just click on 試用版のダウンロード to download it and start the trial. Installation is fairly easy and you can do your usual things with it. So his name is now Gackpoid Demo! I coulnd’t find much information for gackpoid. Your site is the only english site i could find any info with the knowledge of using the program. I’m wondering if gackpoid a “PC only” program? It seems like it is. As my Japanese isn’t very good. So i can’t be 100% sure of that fact. Thank you for the information. I’m a Mac user too. And i really dislike windows interface. I guess i have to succumb to windows just to work this. By the way is this a heavy program? I have not download the trial as i have not set up the bootcamp. i have not use windows in a long time besides in school computes. So i never have the need to get bootcamp up and running. So i’m extremly clueless. Do you know any sources to buy gackpoid beside amazon.jp? Also looking at the link, it says windows vista. Does that mean i have to install the vista OS? i have no experience in vista. Only xp. So i can’t use xp? I can’t find the ”試用版のダウンロード” anywhere, hah. Hey, can you show us how to get the thing? I can't seem to find a link that downloads anything onto the computer. I can't seem to find it either… Maybe I'm not looking hard enough. xD But thank you for informing everyone! Eek! Forget that last comment, I found it. >///< Thank you!